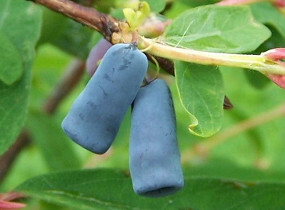 HONEYBERRY (Lonicera caerulea edulis). Fruit. Large, sweet berries, similar to blueberries but with an aftertaste of honey. Unlike blueberries they are lime tolerant. Good eaten raw, cooked or made into jam. High in vitamin C and antioxidants. Very hardy, coming from Siberia, long lived and producing fruit June and July from large cream flowers. Shade loving and disease free. Plant a minimum of 2 for pollination. Plant 5ft (1.5m) apart.